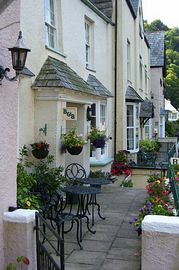 Hillside House is a beautiful listed building, overlooking the East Lyn River at Lynmouth. Many original features are still in place within the house. Several well known historical characters lived at Hillside House including the notorious sea trader Thomas Geen. 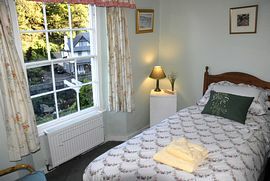 Most of our rooms have views of the river and Lynmouth harbour. 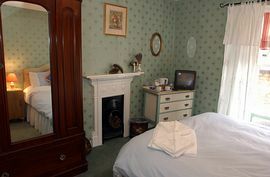 Each centrally heated bedroom has TV, radio alarm, beverage tray and hair drier. 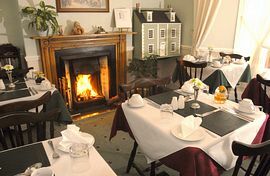 Breakfast is served in our dining room, where the log fire burns in winter; there is a wide choice of breakfast. Many guests take their tea or coffee onto the terrace, to plan the day ahead. We have lots of walking books and maps you may like to borrow. Horse riding is nearby, or you may like to go on a wildlife safari. You can take a boat trip from the harbour, or have a round of golf on the putting green. Packed lunches are available on request. We are open all year. Why not bring your dog with you, it will be made most welcome. 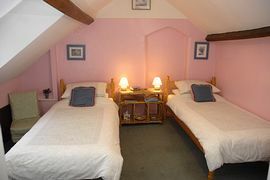 We charge: £27.00 - £30.00 per night per person for bed and breakfast. We offer a reduction on bookings for four nights or more. We are open all year round including the Christmas/New year period. Smoking Facilities: Smoking is not allowed. We have a front terrace where guests can smoke. Special Diets Provision: Special diets are catered for. Please tell us is you have any special diet requirements. If coming by train: The nearest main line station is at Barnstaple. From there you can get a bus to Lynmouth. If coming by car: Lynmouth is on the A39, from the Bridgwater junction on the M5.